You guys! I recently got the most amazing news ever! Next week, little old me, will be jet setting to the UK (first time ever) to check out the latest offering from River Island. The brand launches in South Africa this month (thanks Edgars) and later on, in September, the doors to the first South African River Island Concept store will open! I am so excited that I’ll be getting a first look at what will be on offer, and of course, I’ll share with you guys! I’m also really excited about going to London! Woo Hoo! What to wear?! What to take?! What to See?! Where to Shop?! But the ultimate thing on my mind right now is travelling and getting packed! 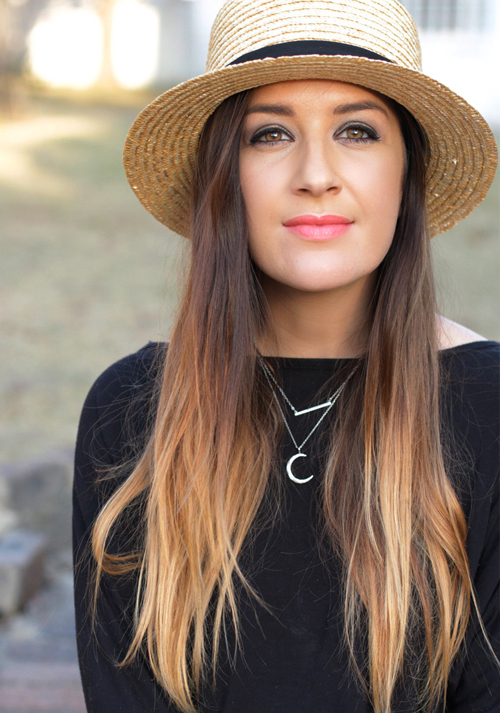 As you probably know, I am obsessed with organising and packing is no exception! I’ve been overseas a couple of times (and locally about a bazillion), and every time I get a little better at packing. 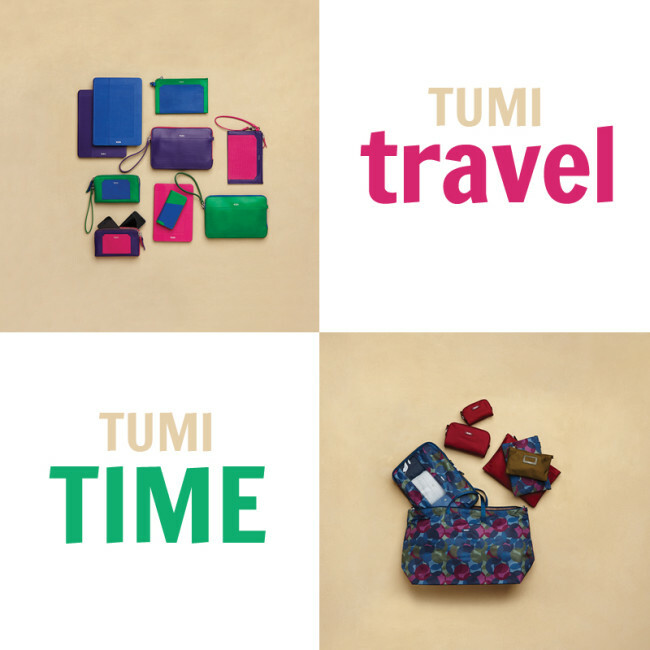 And these goodies from the TUMI Journey collection are right up my OCD organising alley! Fun, funky and lightweight, these little nylon bags offer so much! The Travel Duffel is such an awesome thing to take on a trip where shopping is on the itinerary. It’s super light weight and folds up into a tiny little pouch, so you can stick it in your bag and open it up when you need an extra bag – to pack in all those River Island items I plan to stock up on! Plus, it’s got a little strip at the back so that you can “attach” it to your carry-on. That way, you wont risk looking like a donkey at the airport! The Journey 3-Piece Flat Pouch Set is great to organise things neatly in your travel bag. I’m thinking cables, jewellery, hair clips…. So many options! Then, also on my lust list, is the Large Packing Cube. I don’t know what I’d use it for just yet, but I know it’s cool, I love it and I need want it! I do, I do, I do love the TUMI Brand! So funky and functional! I especially love the PRISM collection, which includes a range of bright & colourful small accessories to keep you organized! 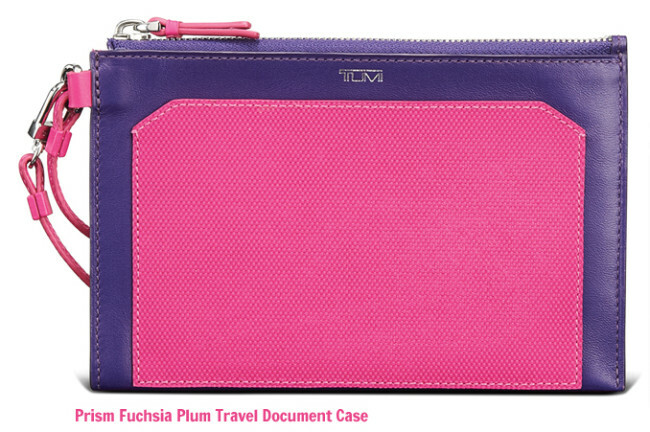 The collection includes Wristles for your iPhone, Slim Card Cases, iPad cases, and then, this beautiful Fuchsia Plum Travel Document Case! Made with smooth leather and textured leather detailing, I seriously have to have one! Where else am I supposed to keep my all my travel documents, in style?! The colours are to die for, but if these are not quite your cup of tea (said with a British accent), there are other seasonal colours to choose from, including; Sunrise, Fuchsia, Atlantic, Plum, Garnet or Black and then color-blocking options in Leaf/Atlantic, Fuchsia/Plum and Black/White. 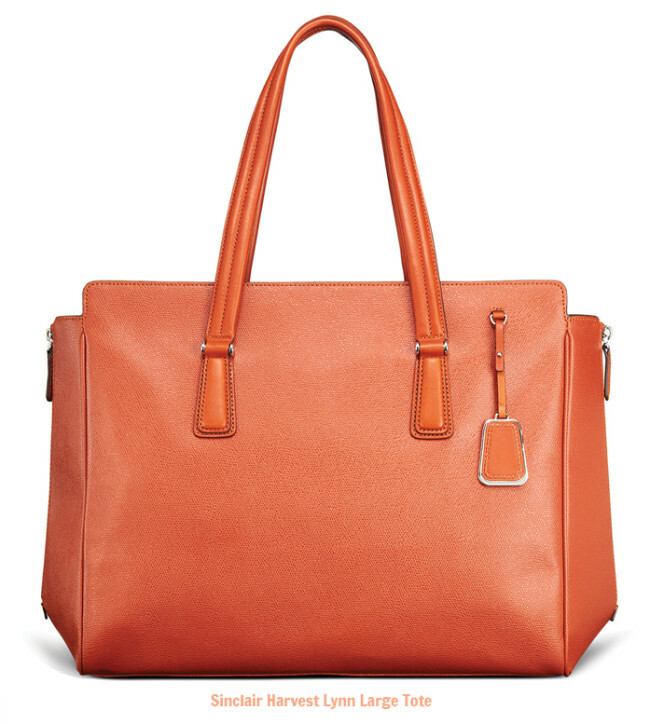 TUMI also makes a gorgeous selection of handbags for travel and everyday! I have my heart set on this little beaut! The Sinclair Harvest Lynn Large Tote has everything, and you’ll understand when you hold it in your hands, why I love it so much! First, I’m obsessed with the colour! A beautiful orange that will not doubt get you noticed. But it’s the bag features that make this bag worthy of investment. I was very tempted to trade in my old TUMI handbag for this one at the recent TUMI Media Day. That’s where I got to hold it and was very sad to let it go! You can’t tell by the picture, but it has double zippers on the side to extend the bag and a large zipper on top to keep all your goodies safe and secure. I don’t know about you, but I like having the option to zip close my entire bag!? It’s super roomy inside (it can even take my 15″ MAC Book Pro), and has a hidden exterior zip pocket, perfect place for my iPhone. If you get a chance, pop into a TUMI store (there’s one at OR Tambo, Sandton City and the V&A Waterfront) and check these babies out! And then! If you have any UK-Travel tips for me, places to see, things to do (solo and safe) please comment below and help a girl out!